Wyndham SeaWatch Plantation offers unlimited ways to have refreshing fun! SeaWatch Resort has a lagoon with fountain and choose one of many pools, lazy rivers, kiddie pools, hot tubs or restaurants for more adventure. 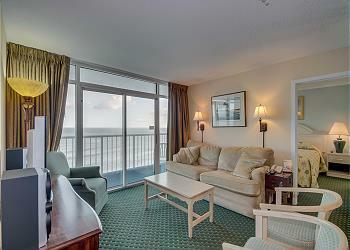 In your spectacular condo, take in the beachside or ocean view from your private balcony. Your condo has a full kitchen and modern furnishings the perfect place to relax from your Myrtle Beach shopping and/or golf game. The resort is located only minutes from the Tanger Outlets, Colonial Mall, Myrtle Beach's famed Restaurant Row and more.